Engadget: "Well, what do you know. Turns out the iPod Touch is a reality after all. While we initially assumed that Mr. Jobs wouldn't be so kind as to bless us all with two new full-fledged iPods in a single day, we're elated that he had other ideas. 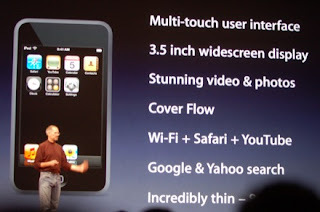 The new flagship iPod has "the same size screen as the iPhone, but it's even thinner" (eight-millimeters, for those taking notes), and it also touts the "same multi-touch interface" found on the the firm's handset. Additionally, it boasts a 3.5-inch widescreen display, the ability to "flick through your photos," and you even get the "slide to unlock" feature, too. And yes, this thing actually has WiFi. Of note, the built-in wireless antenna isn't exactly attractive, but if it means that we can surf the web (YouTube included) on our iPod, we suppose it may be an acceptable flaw. The iPod Touch will be arriving in 8GB and 16GB flavors and will be priced at $299 and $399, respectively, when they ship "in a few weeks." FF: "look like iphone, but will Apple improve their ipod's sound quality? I luv BASS, MEGA BASS, no more radio sound quality pls..."
Engadget: "Those looking for a matching keyboard and mouse set now have yet another option from Logitech, which today busted out its new MX5500 combo. This one includes the company's existing MX Revolution laser mouse with its speedy metal scroll wheel, along with a new keyboard that boasts a built-in LCD along with the usual array of controls for music and other features. Both peripherals also rely on Bluetooth 2.0 to keep 'em untethered from your PC, and each promise to let you take full advantage of Flip 3D and other Vista-specific features (though Vista is not required). Look for this set to be available later this month for $170."